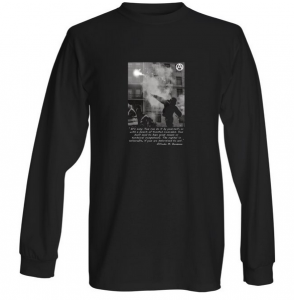 T-Shirt Long Sleeve (Black) with Quote of Alfredo M. Bonanno: “It’s easy. You can do it by yourself, or with a bunch of trusted comrades. You don’t need to have great means or technical competence. The Capital is vulnerable, if you are determined to act.”. Look for other colours in our shop.